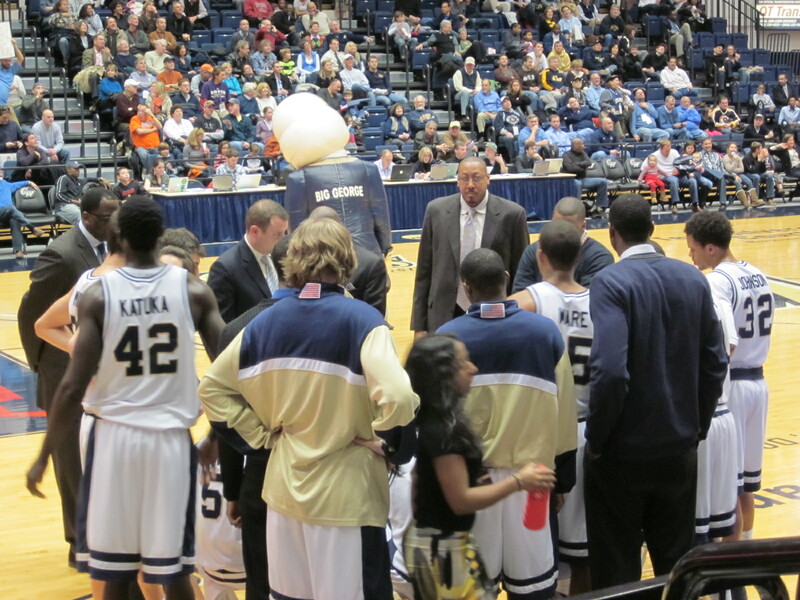 Incidentally, did you know that NBA veteran Donyell Marshall is on Karl Hobb's staff? 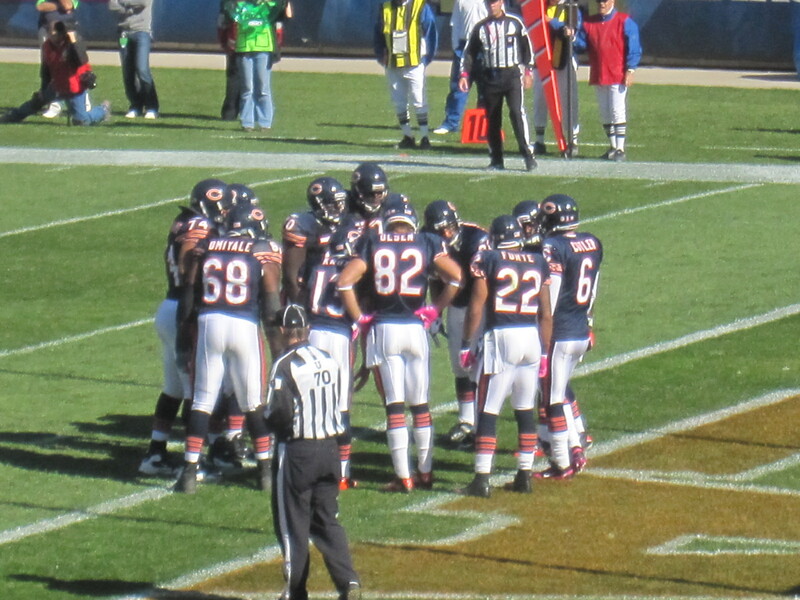 Can you see him looking at the camera from the huddle? My guess is that the University of Connecticut connection didn't hurt. It was my first time watching a George Washington University men's basketball home game, but I have to admit, I had a good time. The Colonials have dropped 4 straight including the loss to Harvard so hopefully, they rebound in their next game against St. Louis. Tonight was a good night to be in Minneapolis. 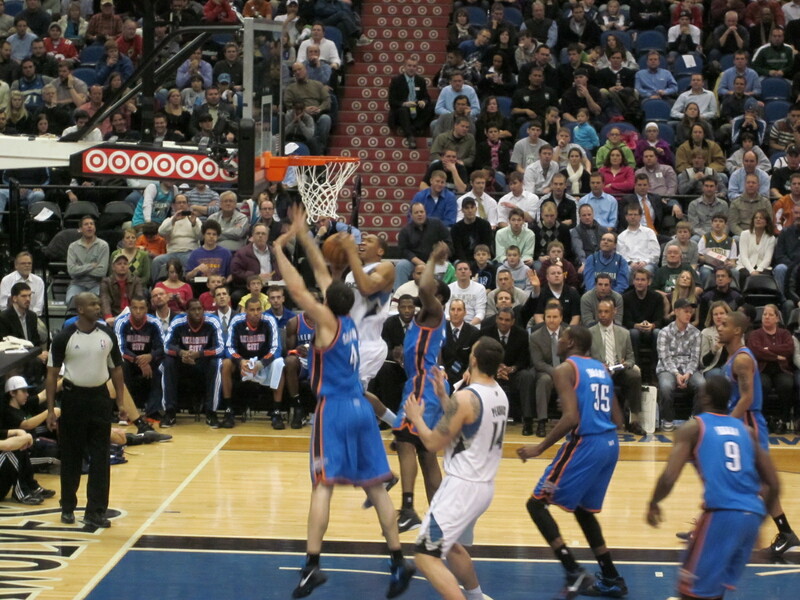 Coach Scott Brooks brought his Oklahoma City Thunder to the Target Center to take on the Minnesota Timberwolves. I feel like the Thunder are in town every month. I know that's not the case, but it feels like I just saw them here. 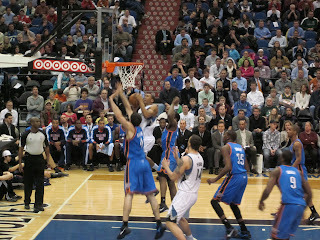 Regardless tonight's match-up went into overtime and Kevin Durant blew up for a million points and a thousand rebounds. Ok. So he didn't really have a million points and a thousand rebounds, but it felt like he did. 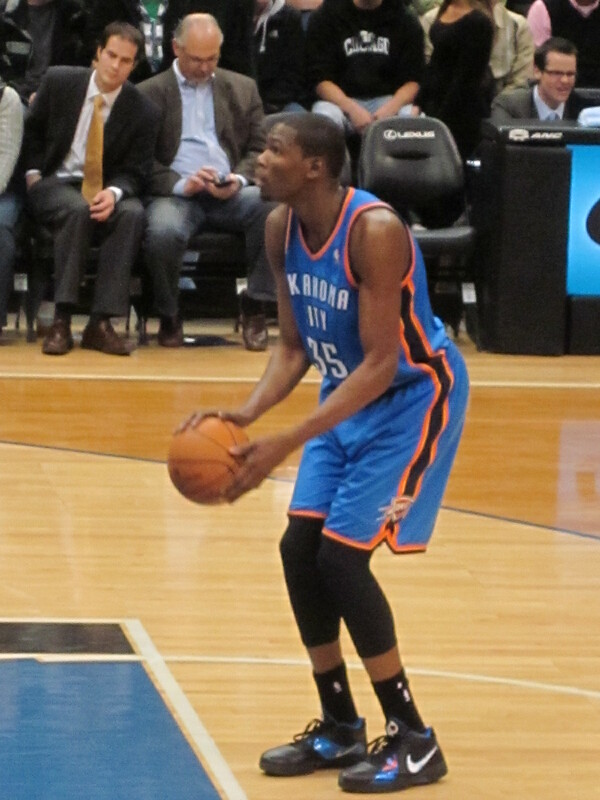 Durant ended the game with 47 points and 18 rebounds. That's not a typo. He had 47 points and 18 boards. 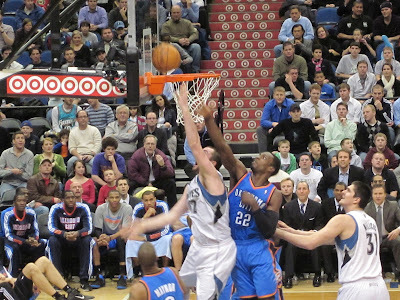 Jeff Green was the 2nd leading scorer for the Thunder. He dropped 19 points and contributed 8 rebounds. During the 1st half of the game Russell Westbrook had a monster one-handed dunk that I would've taken a picture of to post here, had I not been looking at my in-seat menu. Seriously?!?!? When am I ever going to learn not to turn my camera off and to pay attention ~ especially when high-flying athletic players like Westbrook are on the floor. 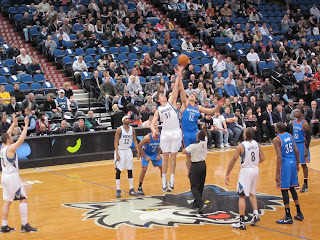 For the Minnesota Timberwolves, the dynamic duo of Michael Beasley and Kevin Love came ready to play. Beasley had 30 and 9. Love had 31 and 21. Love is a tough. 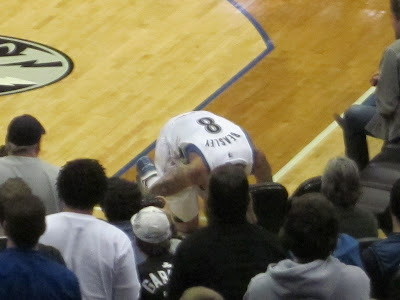 During overtime he hit the floor and everyone at the Target Center held their breath, until he got up off the floor. He hit the deck right in front of me and I swear I heard it. Ouch. 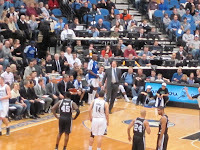 I told the guy next to me that the Timberwolves would lose. I don't mean to dog the team, but the guys are just too young and/or inexperienced to close close games out. It's sad, but true. 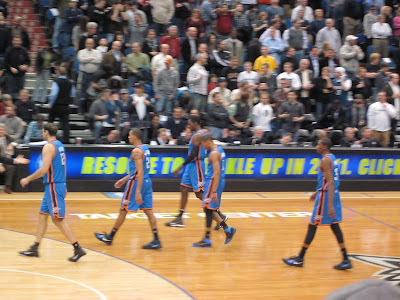 This game was winnable for the young Timberwolves, but the Thunder rocked the Target Center to win, ultimately with a score of 118-117. Kevin Durant blew up in a career game (i.e. 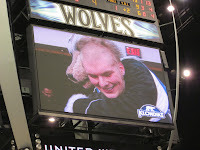 that went into overtime), during my final night in Minneapolis. I'd say we both went out with a bang. Thunder Up! **** Last, but not least, just in case the assistant coach I met in the hotel concierge lounge before the game reads this post, I should point out that I was right. Wes Johnson plays for the Minnesota Timberwolves. This is a picture of him in the air going for a lay-up. 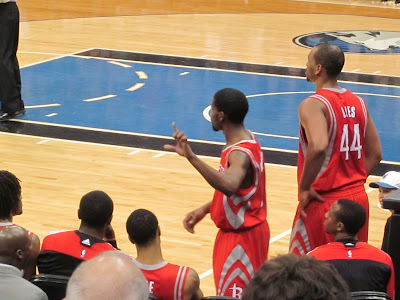 Rockets defeated the Timberwolves ~ Brooks throws up the "loser sign"
The Houston Rockets came into the Target Center last night and defeated the Minnesota Timberwolves. The final score was 125-129. 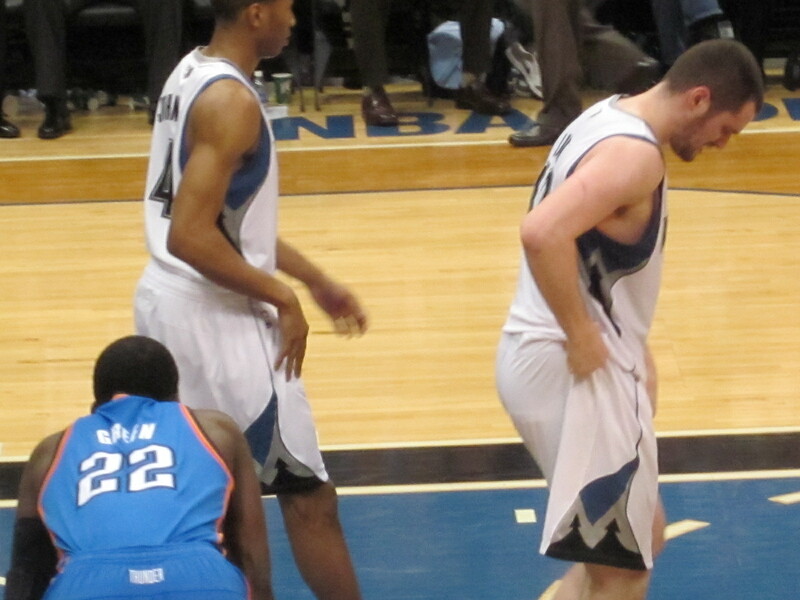 The game didn't really get exciting until the end when the Timberwolves started to make a run. Before the game another guy asked if there were any stars on the Houston Rockets. I answered for the guy, "Not unless you count Shane Battier as a star." I kept it moving. I actually am not familiar with the Rocket's line up. I just know that without Yao Ming, it's tough to watch them. **** I wasn't going to debate Shane Battier's star level. He's a Duke alumnus, so therefore I support him. Speaking of Battier, I couldn't help but notice he was guarding Michael Beasley. 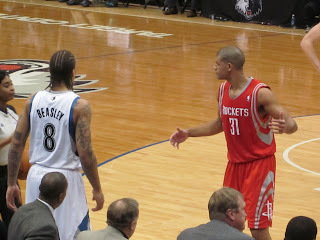 Talk about opposites... Battier is clean cut, and Beasley isn't... Personally, I like Beasley's game better. It's more exciting. 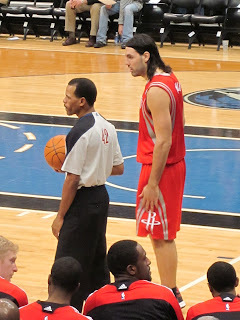 Honestly though, with Luis Scola's freakish resemblance to adult Jesus, how were the Timberwolves expected to win? 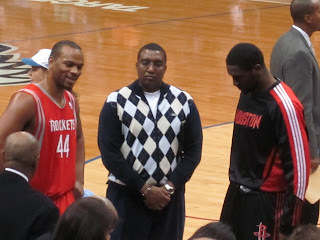 Speaking of look-a-likes... Who's the guy on the Rockets' staff that looks like American Idol judge, Randy Jackson? I could look it up or you can just tell me. Things during the game were ho-hum, but got more interesting around the last two minutes. Yes, everyone says you don't need to watch an NBA game until there are 2 minutes left on the clock. In this case, around the 2 minute mark, Aaron Brooks and Kevin Love tussled and Brooks threw the ball at Love's chest. Have you seen Brooks and Love stand next to each other? Brooks more or less comes up to Love's armpit. Regardless, it was a weird exchange and Brooks hit the Rockets bench shortly after. After getting his 6th foul, on his way to the bench in case Timberwolves fans couldn't read the scoreboard Brooks flashed the "loser sign" to the Timberwolves crowd. Father-Daughter Vegas vacation ~ Great laughs, big wins!! My dad is the best, and we just had another father-daughter weekend in Vegas. What started out with father-daughter dinners as a girl scout and father-daughter dances in high school graduated to weekends in Vegas. It may not be for everyone, but it works for us! Here are some random thoughts, status updates, and quotes from the weekend. Just landed in Vegas. Flight attendant says that our bags are coming in on carousel 7. The guy behind me starts yelling, "seven"! I turn around and say, "So you're a don't guy?". He says, "yep". End of discussion. 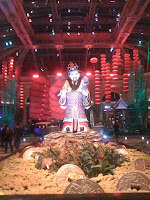 Eventually, my dad got hungry so it was off to Gaylord India Restaurant at the Rio Hotel and Casino. It's one of our favorites. As soon as we ordered, there was an Asian waitress that came over. Me: You can't call her that. Dad: What the hell are you talking about? I'm talking about the bigger dishes (as he holds up the new plate). 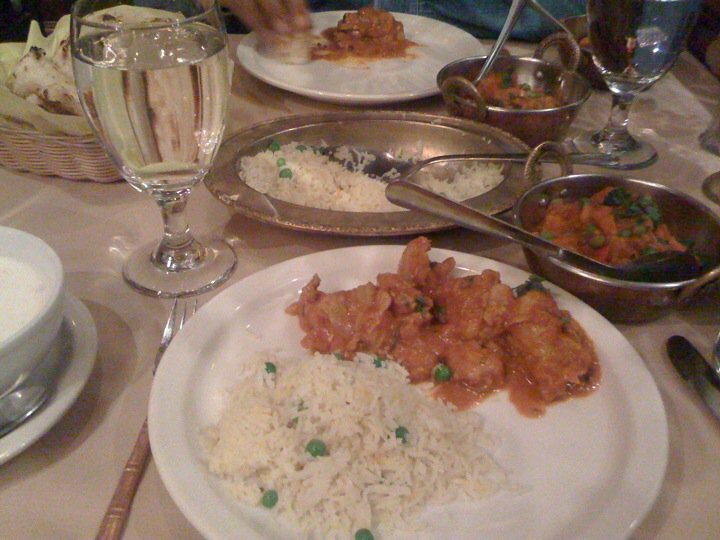 We ordered the chicken curry. When it came out, there was also some vegetarian curry. Me: What's in the vegetarian curry? Dad: Vegetables are for poor people. 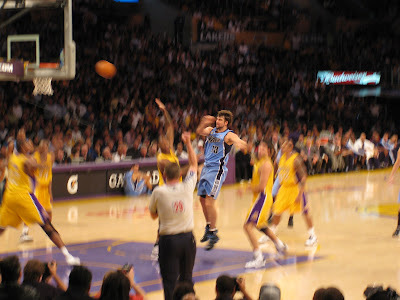 Friday night I bet the Atlanta Hawks to cover against the New Orleans Hornets. Friday night, was also the night that history was made and the Hawks only scored 59 points (i.e. the lowest point total in FRANCHISE history)... ARE YOU KIDDING ME?!!? Absolutely ridiculous. Friday night I was playing rapid craps over at Bill's. It was painfully slow, but it was great to sit and laugh and catch up with my best friend. We sat there betting the "Don't" since it was impossible for any shooter to get into any kind of rhythm with a slow dealer. As we were sitting, he said "Isn't that your dad?" Sure enough, my dad was walking into the casino. I was happy to have them both there and I re-introduced them. Within a few minutes my dad left to go get some food. Later that night, I checked out The Cosmopolitan (i.e. I believe it's a Marriott property). It's fancy. I don't think it's for a serious gambler. It's more of a see and be seen place. I didn't check out the table minimums this trip. I'll do it next time. I also walked over to Vdara Hotel and Spa. The rooms are nice. I saw an executive suite. It had a kitchen, washer and dryer, etc. but no casino. 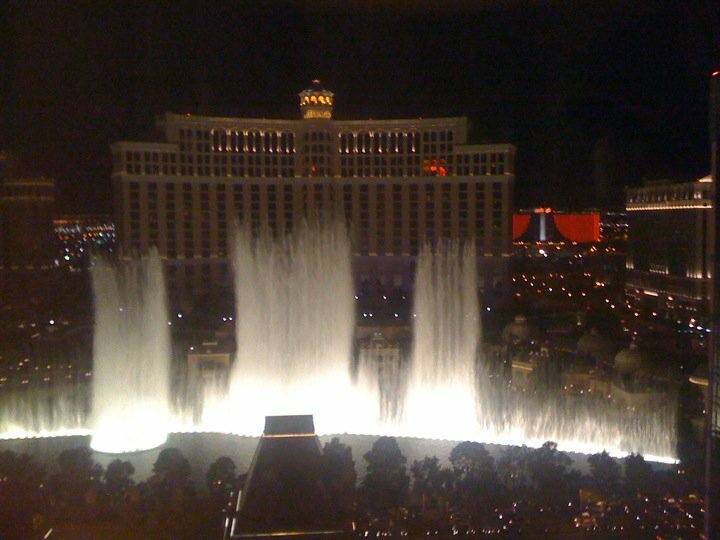 It was nice, but for my money and the location, I'd rather stay at the Palazzo or Venetian. 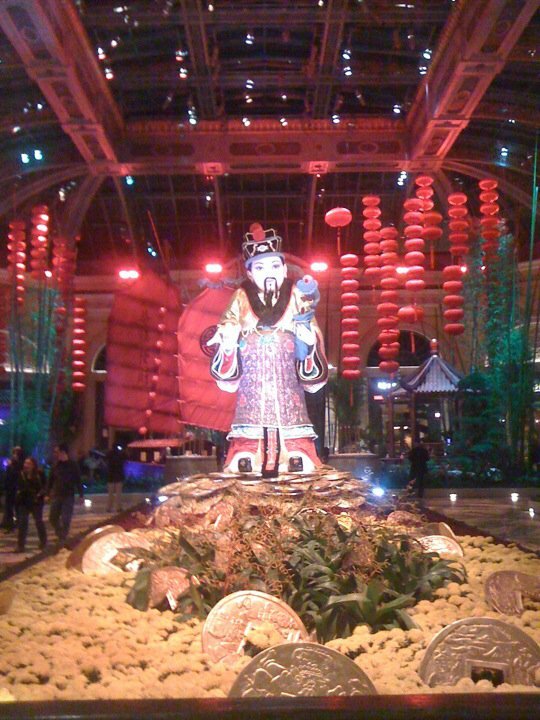 I passed through the Bellagio on the way back to the strip. There was no robbery taking place so it was cool. 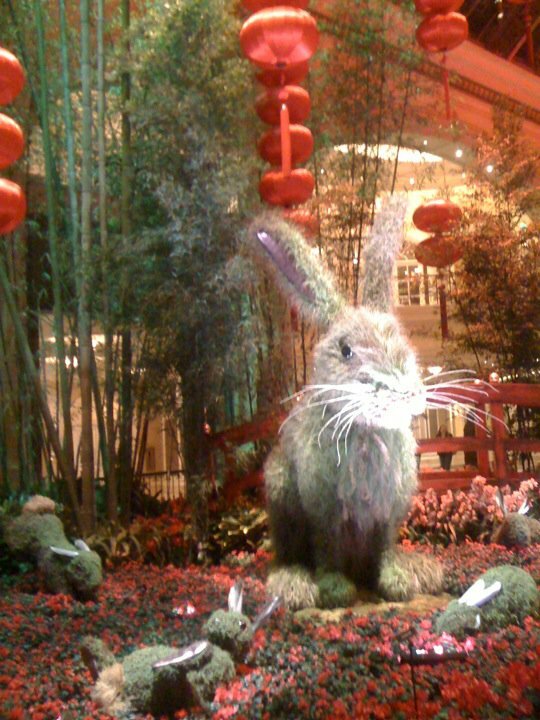 Based on the decor there and near the Palazzo, I think it's the year of the rabbit. I'm a rabbit and rabbits are lucky so I couldn't resist taking pictures. Saturday I dragged myself down to the sportsbook to bet on Ohio State. The Buckeyes are ranked #1 and were in Illinois. I had Buckeyes -3.5, the money line, and in a parlay with the Washington Capitals. All the bets were winners! Saturday night I was at the Venetian's sportsbook, watching the Golden State Warriors v Los Angeles Clipppers. Wankster looking Asian guy in sportsbook yelled, "Real LA fans are Clippers fans because people from LA can't afford Lakers tickets!". Instantly 3 other Asian guys raised their hands and said, "I can afford them.". When I went to check on my dad he was sitting on a stool playing craps with thousand of dollars in front of him. No wonder he wasn't bothering me. I tapped him and told him it was time to go. After another 10-15 mins he left the table a WINNER. He has to sit since he's not really in condition to stand at a craps table for an extended period of time (i.e. read HOURS). He's assured me he's going to start exercising so he can walk the strip more and stand longer. I find this completely hilarious and have asked him to document his training regimen so I could laugh some more. He thinks that I'm kidding. I'm not. Back in the room dad was tired and was rubbing his legs since they were sore. Before I left I gave my dad specific instructions to bet on the Green Bay Packers and the Pittsburgh Steelers for the AFC and NFC Championship Games. I couldn't place my bets since the book had closed, and I was leaving. He could and did. Me: Go collect the money. Me: Duh. Of course we did. We cleaned up nicely... Now I just need to figure out how to get the money from him. Steelers and Packers ~ I told you so!!! 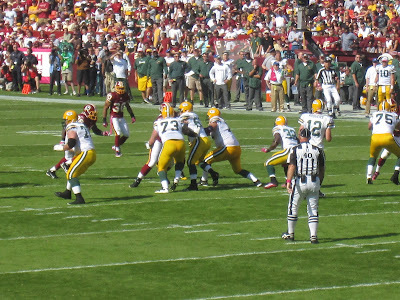 The Pittsburgh Steelers and Green Bay Packers have advanced to the Super Bowl. 1. I told you so. 2. My dad had to place my bets for me in Vegas, since I left this morning, but who cares... WE WIN!!!! I missed most of the Packers game since I was flying, but needless to say I watched as Jets fans had a glimmer of hope. J-E-T-S = L-O-S-E. 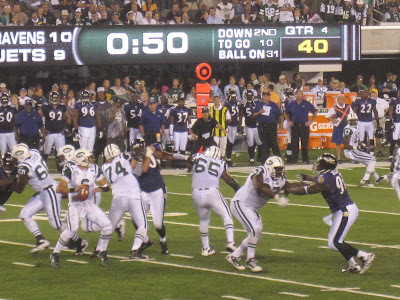 Sorry, New York Jets' fans. You're never going to win with Mark Sanchez as your quarterback. Don't believe me? That's fine. You have the ENTIRE off-season to think about it. 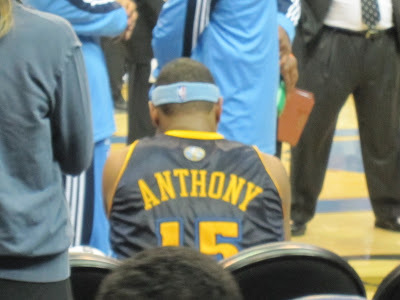 Nets walk away from table, where Carmelo never sat ~ Trade drama over "for now"
My prediction: Carmelo Anthony plays out the season in Denver as a Nugget AND then goes to the Knicks... I don't believe the Chicago Bulls talk... That's my 3 cents based. **** Why 3 cents? It's 3 cents because I'm smarter than the average person, and the average person gives you 2 cents. I don't believe that Prokhorov is bluffing. I really believe the New Jersey Nets are out of the mix. I don't believe Carmelo wanted to play for the New Jersey Nets anyway. I think that if Carmelo isn't moved before the end of the season, he will have even more interest in what happens over the summer with regard to the Collective Bargaining Agreement (CBA). I think that New York Knicks fans will have to hold their breath and wait to see what Donnie Walsh comes up with regard to an offer for Carmelo. 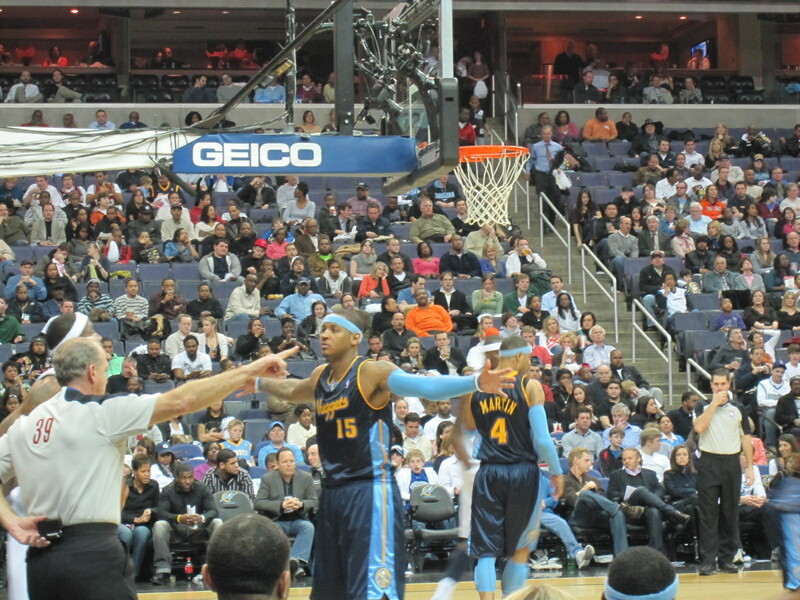 **** I took the pictures for this post during the Nuggets v Wizards game, February 2010. 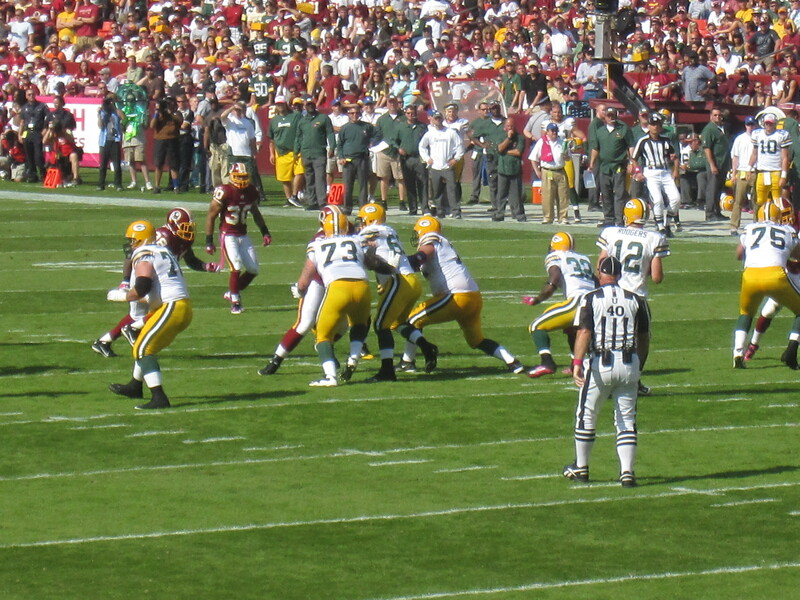 I'm going with the Green Bay Packers and the Pittsburgh Steelers. I saw the Chicago Bears lose to the Seattle Seahawks earlier this year too. 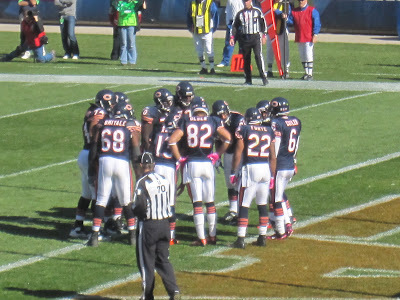 I don't have any strong feelings about the Bears, but I'll admit I'm not really a Jay Cutler fan. The most interesting thing about him for me right now is that he's dating Kristin Cavallari, and even that tidbit of info is getting old. 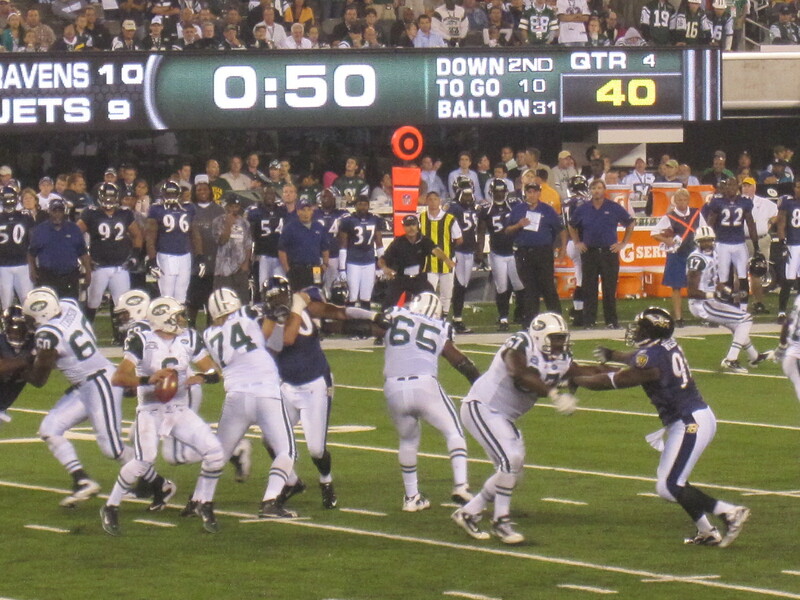 I like the New York Jets, but I just can't get behind Mark Sanchez. I don't believe that he thinks he's a winner. I didn't go to Heinz Field this year, but I was there in 2009 when the Steelers hosted the Cleveland Browns. 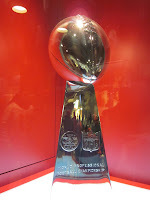 As for the Super Bowl, I'm going to hold off on my prediction. NBA: My thoughts on the Eastern Conference ~ Can't we just pick 6? I was talking to my friend, Teri, over the weekend and we were talking about the Eastern Conference and how it's "weak" relative to the Western Conference. The final 2 spots in the East as of now are being held by 2 teams that are below .500. When was the last time any of you basketball fans were clamoring to see the Sixers or the Pacers this year? Yeah, I know. Me neither. Granted it's still early, but my initial reaction is "ewwwwwww". I like the Boston Celitcs on top and with Kevin Garnett back in the line-up, let's hope they stay healthy. Now I just need to check and see if there's a time table for Kendrick Perkins. 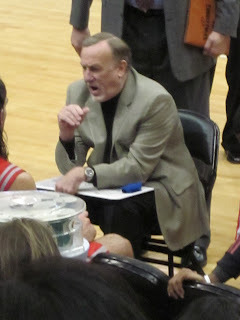 I know Perkins has practiced, but last I saw he was on the bench during the game. I'm anti-Lebron but pro-Dwyane Wade/Erik Spoelstra/Pat Riley, so I'm torn when it comes to the Miami Heat. Even being anti-Lebron, I have to admit that play when he twisted his ankle, went out of bounds, and then drained a 3 from the corner was impressive. Yes, I'm not blind. I saw it, and I was impressed. How about Derrick Rose's triple double (i.e. granted it was against the Memphis Grizzlies, but it still counts)?!?! 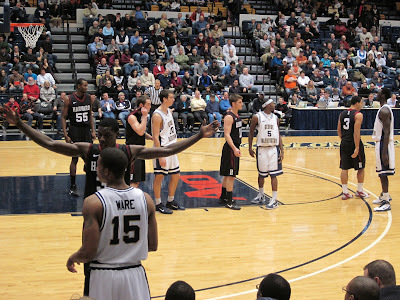 What about Kyle Korver's 3-point shooting? If those guys can keep up the effort and keep making shots while Boozer is out, then I'd consider the Chicago Bulls to be a viable threat. I'm just not sure about their strength with Joakim Noah still out of the line-up. I think the biggest surprise is Atlanta. In the words of Elmer Fudd, they've been "very, very quiet" yet the numbers don't lie (27-15). I like the Knicks and am impressed with how well Amare Stoudemire is playing. I anticipate heading to Madison Square Garden again before the NBA All-Star break to catch the Los Angeles Clippers and/or the Los Angeles Lakers in town. I'm not sure how long the Knicks can continue to "bring it", but I am pulling for them. Those are my thoughts on the East. 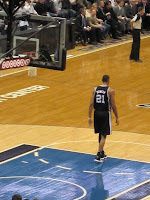 NBA International players to cross the pond if lockout ~ I say, "No"
I've been reading a couple of headlines related to international players in the NBA (e.g. 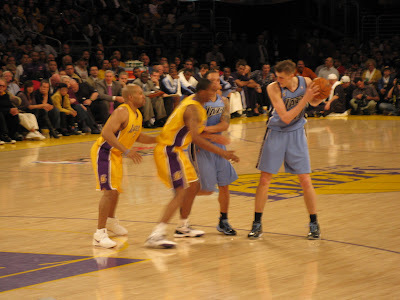 Mehmet Okur and Andrei Kirilenko) and the plans they're "considering" if there's an lockout next season. Having survived a NBA lockout in 1998 with an international player who also entertained offers from other teams in Europe (i.e. if I remember correctly, I remember a team in Spain was interested), I'm willing to call the player's bluffs. If these guys start looking for their passports, my bet is that they're going for pleasure and NOT business. Is Okur going to hop a plane to Europe, if there's a lockout? Is AK-47 taking his ammo across the pond, if there's a lockout? I'm not about to read up on Okur and Kirilenko's contracts, but I do feel as though they're solid in the NBA and have viable careers. I have no idea what their making in terms of $$$, but I do feel like the risk of injury overseas is too great. We're not just talking about international competition like the Olympics and FIBA World Championships. We'd be talking about a "season" or partial season. If you think I'm buying the story that these guys (i.e. and not specifically Okur and Kirilenko) or anyone with a viable NBA career are going to pack up and head overseas, you're fooling yourself. You'd have better luck selling me season tickets to one of the bottom dwelling NBA squads that are always mentioned in the same breath as the word "contraction". **** Actually now that I think about it, both stories about an international player heading across the pond are about players with the Utah Jazz... Random, but I think pure coincidence, since the Jazz are having success at 26-13. FYI, I took the pictures for this post back in April 2009. The Thunder have me wanting to do something I've never done before... I'm seriously thinking about going to Oklahoma City. 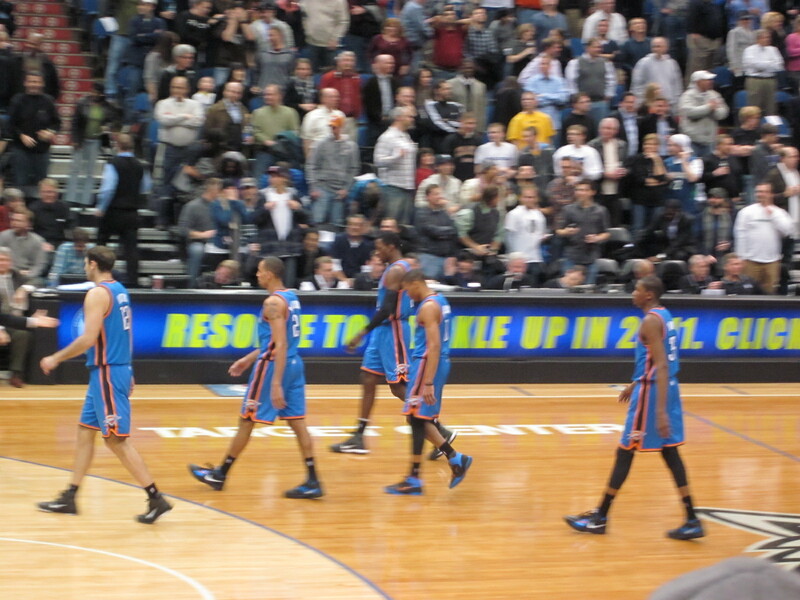 I've seen the Thunder on the road many times, and they're exciting to watch. I have yet to see them play at home though. 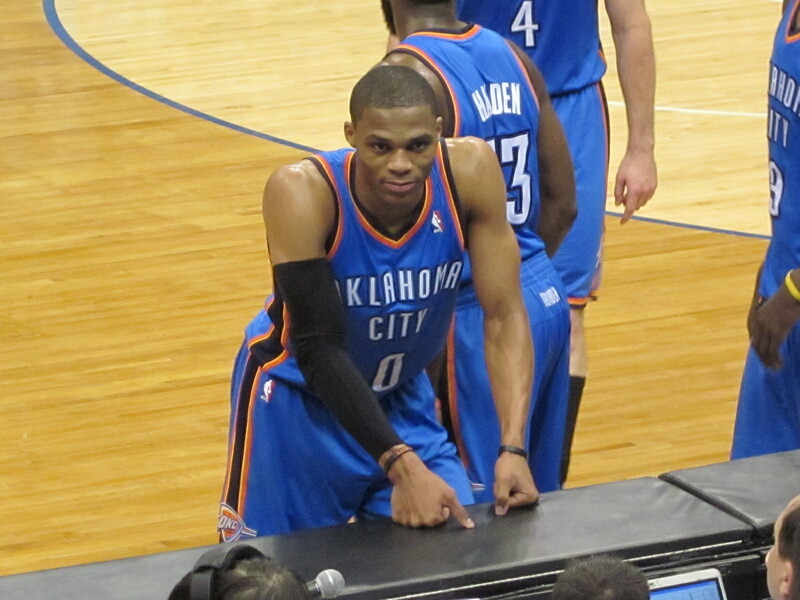 Russell Westbrook had a triple double tonight (i.e. 32 points, 13 assists, and 10 boards). 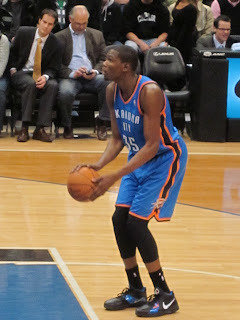 I know Kevin Durant gets a lot of much deserved attention (i.e. 36 points tonight), but for those of you that aren't paying attention to Westbrook ~ get your head out of the sand and open your eyes! 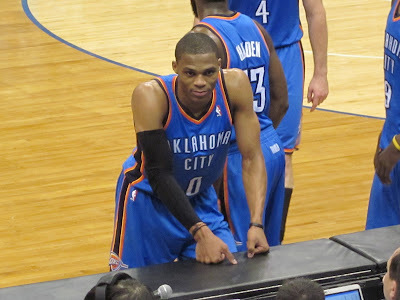 Westbrook is tough, and the 1-2 punch of Durant and him is lethal. Don't believe me? Ask the Orlando Magic who lost tonight. Final score of the game was 125-124. The game was HOT. 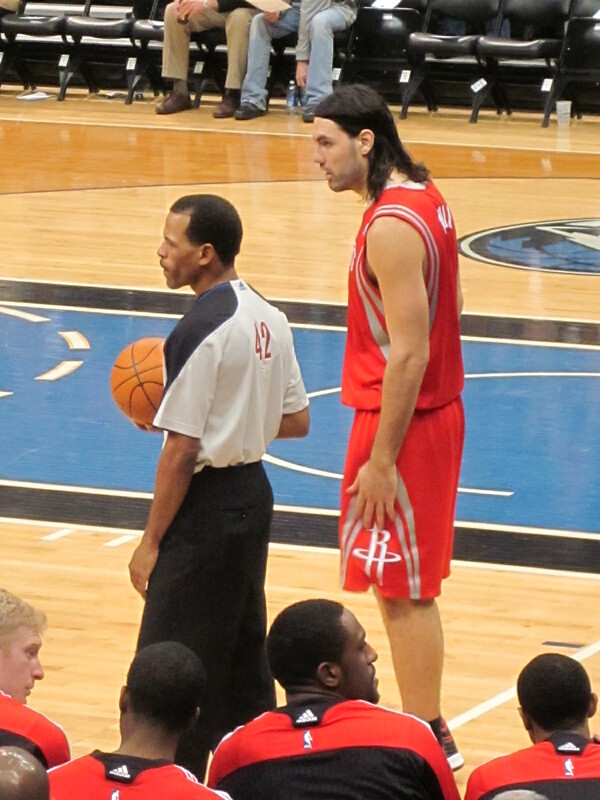 Dwight Howard had 39 points and 18 rebounds, and Orlando erupted in the 4th quarter. However, the Thunder held on. I will admit right now that I don't pay attention to the Trail Blazers. 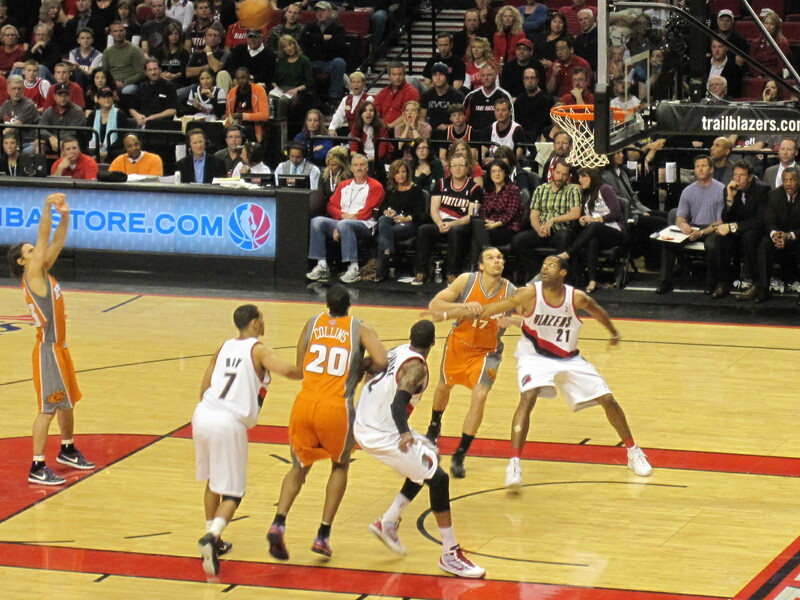 I was at the playoff game between the Blazers and the Phoenix Suns on April 20, 2010. If I remember correctly (i.e. and my files are correct) it was a Game 4. Brandon Roy actually returned to the Blazers line up that game and dropped 10 points. The Blazers won that game by a score of 96-87. Things are definitely not "rosey" at the Rose Garden... Last year, I saw Brandon Roy return. I'm not sure I'll see the same thing happen this year. I found a video on Youtube of Ken Mauer giving out five technical fouls to the Minnesota Timberwolves last night, when they hosted the San Antonio Spurs. The video isn't that great, but I'll take it. Yep, 1+1+2+1 = 5 techs in 10 seconds. I don't know if I'm alone, but it kind of reminds me of the scene in the movie, "Clue", where the Butler tries to count the bullets in the gun. For those of you not on Twitter, I have no idea what it's going to take for you to get with the times if you're a sports fan. 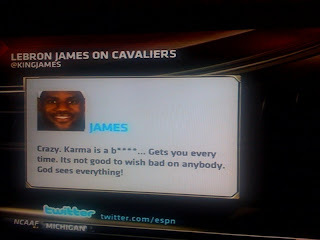 Check the latest Tweet from Lebron James (aka KingJames on Twitter): "Crazy. Karma is a b****.. Gets you every time. Its not good to wish bad on anybody. God sees everything!" Yeah, the Cleveland Cavaliers just got blown out by the Los Angeles Lakers. The Cavs were without Anderson Varejao, and the fact that that makes such a difference is sad in itself. The final score of the game was 112-57. I think that the Cavs should offer Ted Williams (i.e. the man with the voice) more than an announcing job. Perhaps they should let the man try out for the team. It couldn't get much worse... Could it?!?! I feel bad for Byron Scott. $20 tonight would've gotten you a ticket to see the San Antonio Spurs v Minnesota Timberwolves. The final score was 107-96. Kevin Love had another double-double, 20 points and 20 boards. 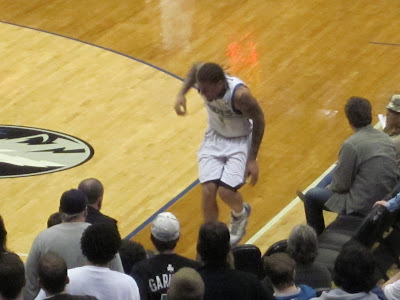 Michael Beasley played but has been bothered by a bad ankle. 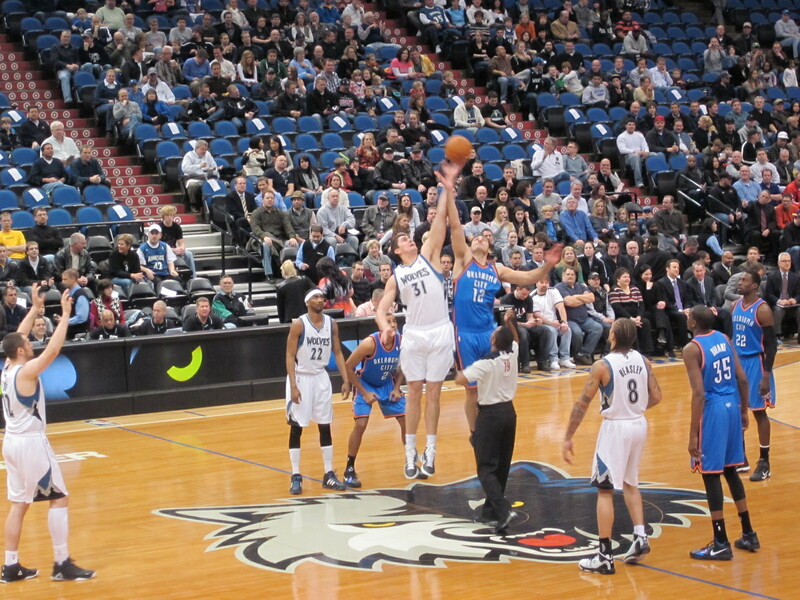 Luke Ridnour and Martel Webster both contributed 18 points in the losing effort. 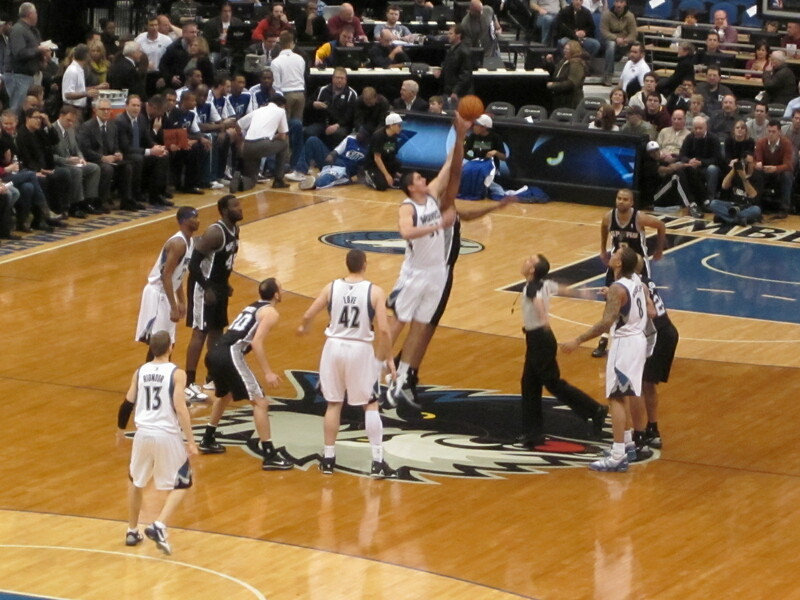 The Timberwolves shot poorly all night, 38% was the field goal percentage. No one will beat the Spurs shooting 38%. It's not rocket science. The Spurs were just too tough for Kurt Rambis' squad. Correction: Maybe I should say Bill Laimbeer's squad since the technical fouls were flying and Rambis was ejected with about 8:30 minutes to go in the 3rd quarter. 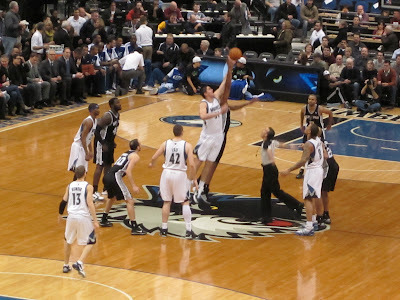 I knew that the Spurs would win tonight, but I thought that perhaps the Timberwolves would raise their level of play to compete. 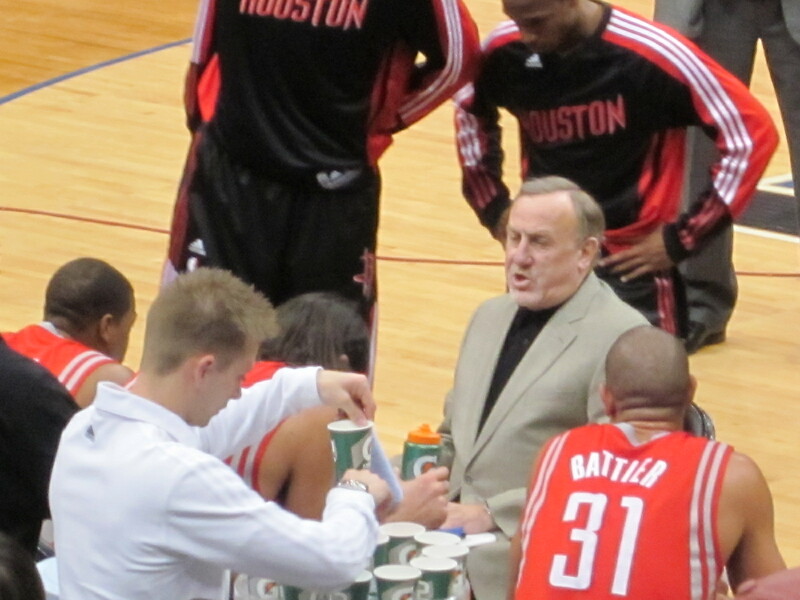 I also thought tonight's game would be a chance for Gregg Popovich to rest his "starters". I was wrong. Tim Duncan, Richard Jefferson, Manu Ginobili, and Tony Parker all contributed substantial minutes and balanced scoring. As much as I'm not a Tony Parker fan, I can't deny the fact that the man is good. 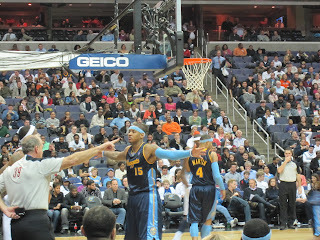 Here's a picture of him in the air, after driving the lane, and dishing the ball to a teammate for an assist. There wasn't much energy in the Target Center tonight. I think the most fan energy came out during the t-shirt toss. 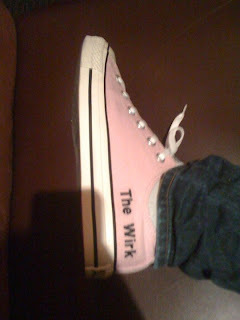 Regardless, for $20, I was pleased with the level of entertainment and had plenty of Tweet material. 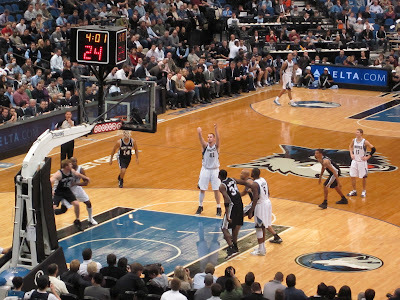 There was a very scary moment for Timberwolves' fans when Beasley drained a 3 with just under 4 minutes left in the 4th quarter. He landed and immediately grabbed his ankle. 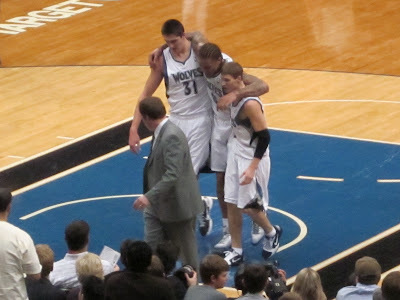 He was able to get up, but hopped as he was helped off the court. Spurs maintain their dominance and improve to 32-6. Timberwolves settle for 9-30, and everyone hopes Beasley's not hurt seriously. 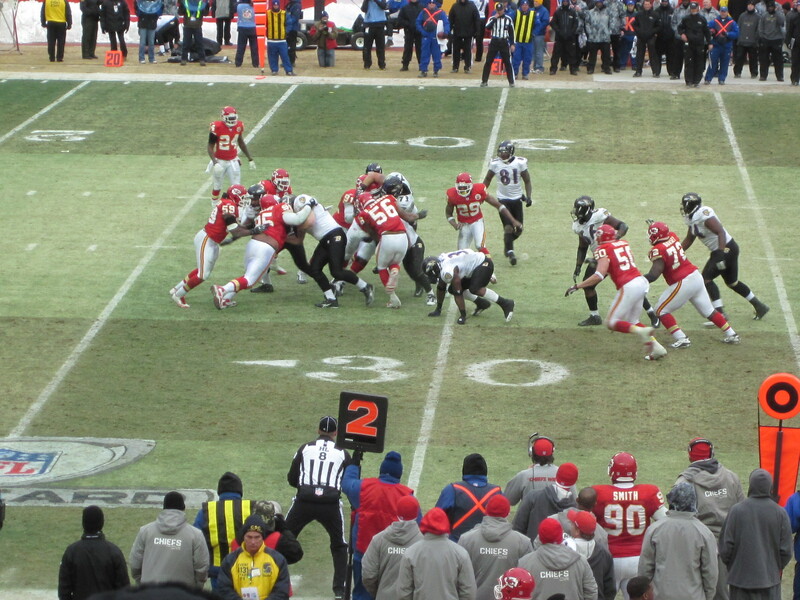 Here are my Tweets from the game. If you're not following, you're missing out. Most recent Tweets are on top and the older ones are towards the bottom. Beasley just drained a 3 and went down. Had to be helped off court. He hopped to locker room. 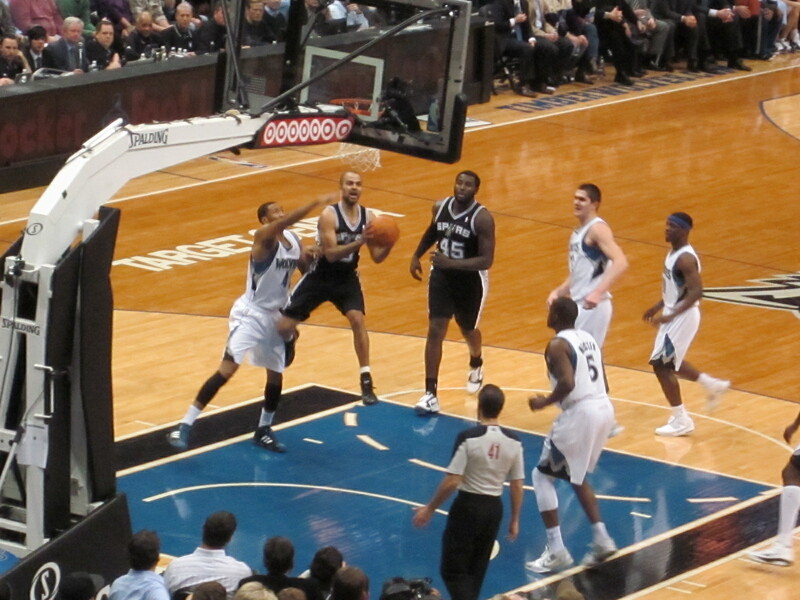 #Twolves v #Spurs. Fans headed to exits. 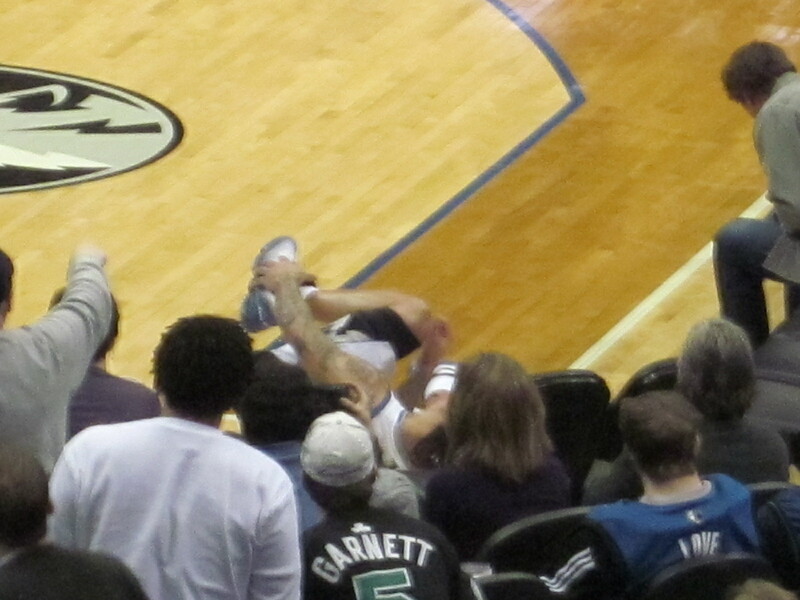 They're tossing t-shirts into crowd and finally Target Center wakes up. 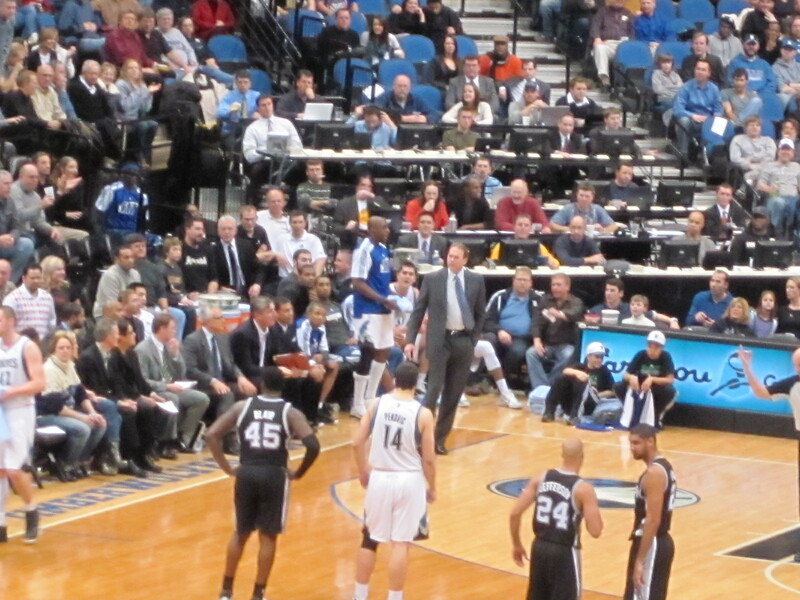 Game isn't out of reach for #Twolves v #Spurs but no energy here. 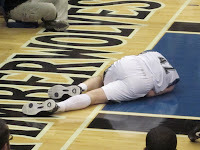 #Twolves fg% is 39%... 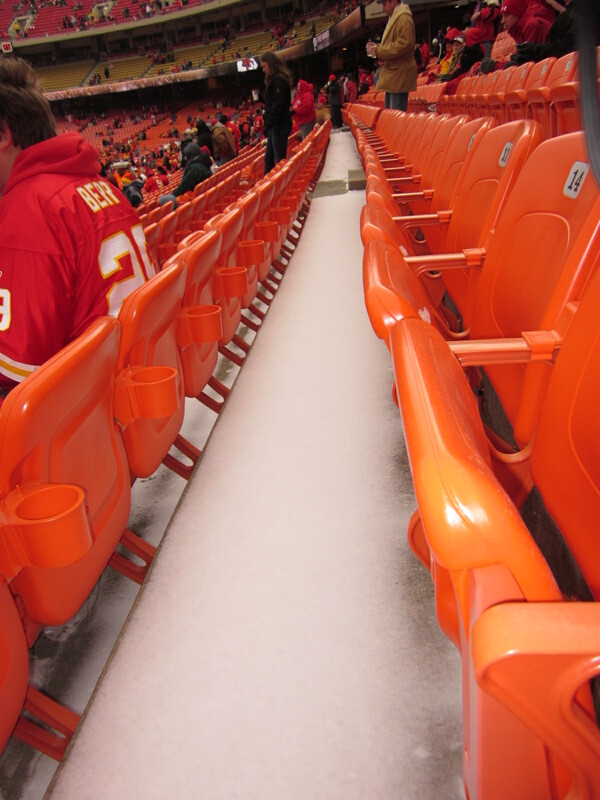 Shooting is so cold in here, that I might need my handwarmers from the AFC Wildcard game in KC. #Spurs up 93-83. 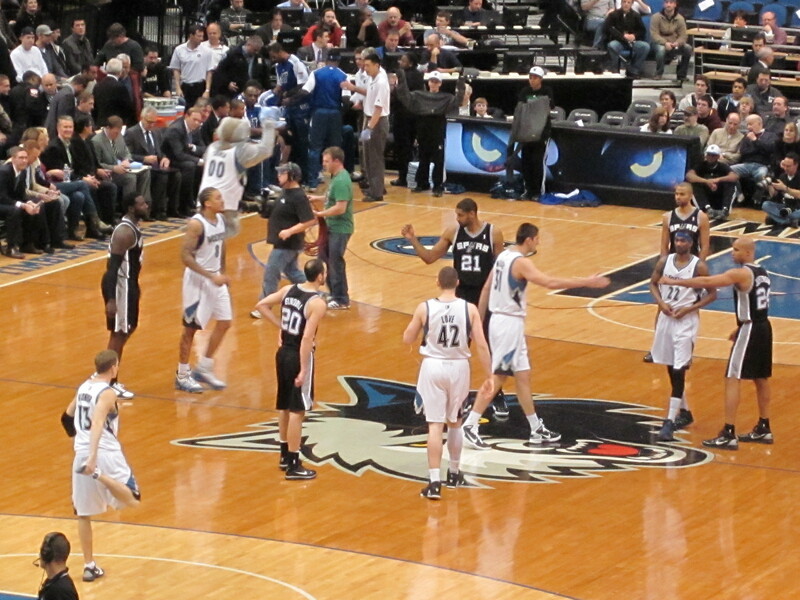 #Spurs v #Timberwolves... #Beasley playing... Let's make it a ball game! I just got a technical foul from Ken Mauer... Wait.. What?!!? LOL. Athlete, Coach, or Media ~ How would you choose? I've been doing some thinking, since I've been seen some things and been hearing a lot of stories lately. If you're playing a game of FMK and these are your choices: athlete, coach, or media person, what would you decide? Obviously, you have to use the generalities and stereotypes associated with each type of person but like I said, I'm curious what people think. It might be a simple decision for some of you, but I think it's a very careful one that people who wade in this pool need to ponder before jumping in. I think people get very short-sided and don't think about the consequences of their actions. I've seen naive girls get swept up in it all and spit out. People need to remember that once you lose respect, you've basically lost everything. **** I guess we could add front-office in the mix, but for the sake of this argument, let's leave them out for now. The choices are just lovely, right? Assuming you find all 3 choices attractive, in the hierarchy of the sports world, does the athlete always rank #1? I say, NO, but what do I know. I guess it depends on what the person wants. Anyway, like I said, it's just something I've been doing some thinking about. 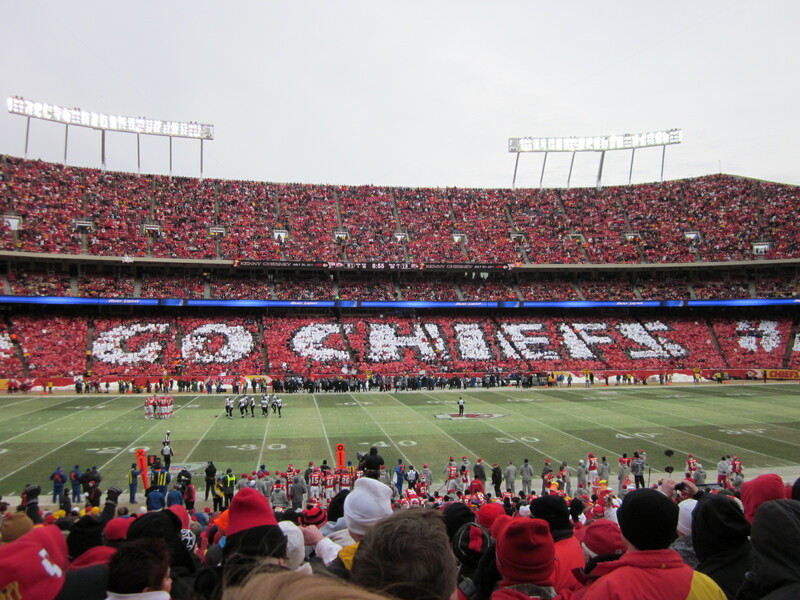 Cross Arrowhead Stadium off the list. 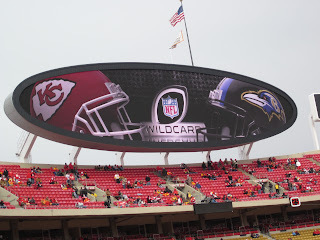 I went to Sunday's AFC Wildcard game and watched the Baltimore Ravens play the Kansas City Chiefs. ﻿I have some dear friends who think I've got "issues". That's fine. Everything is a means to an end, and my goal is to hit all the stadiums, arenas, and ballparks for professional football, basketball, and baseball. Friday I was basketball. Sunday was for football. I travel because I want to and because I can. 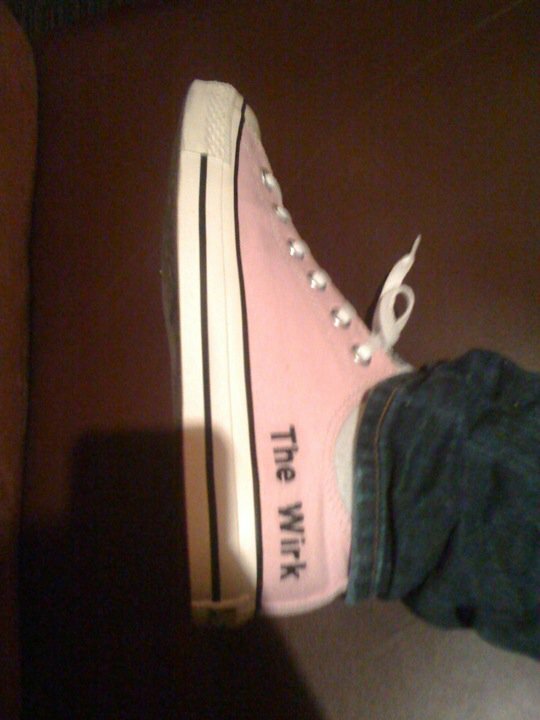 I have plenty of frequent flier miles and time. I have status on various airlines and don't mind air travel. Plus, unlike most of the people that complain about my schedule ~ I'm YOUNGER by at least 10 years. **** That's right. I know some of you are lying about your age, but I KNOW I'm younger, and therefore I have more energy. My journey to Kansas City started early. 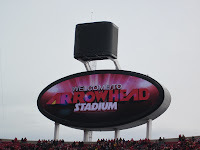 It was my first trip to Kansas City and my first trip to Arrowhead Stadium. I'll make it back to Kansas City eventually to see a Royals game, but then I'll probably just cross the city off the list. There were so many Baltimore Ravens fans on my flight that it might as well have been a charter. When I arrived in KC it was almost 10AM so I decided to grab a cab and head to the stadium. I'll tell you right now that a cab to the stadium isn't cheap. However, I'd rather pay than deal with driving, parking, and refueling a rental car when I do short trips like this. 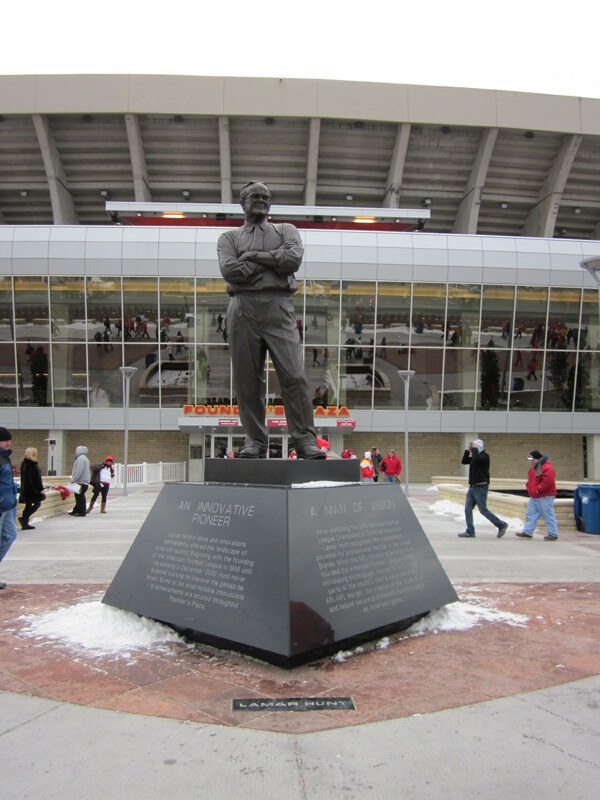 Arriving at the "New Arrowhead" stadium a little before 11 was perfect, because it gave me time to check out the Chiefs Hall of Honor. **** I asked the old man sitting next to me why it's called the New Arrowhead Stadium and he said it's not "new", but that it's been re-done. Well that explains that. As I took in the sights and sounds around me, I tried not to freeze to death in the 14 degree temperature. **** There was snow on the ground. I spent $8 on two packs of handwarmers. With one warmer in each boot and coat pocket, I managed to hang in there for the whole game. Honestly, I need to make a mental note to plan on the weather before I decide to settle on a game. Why on Earth did I think Kansas City would be warm?!?! I must be losing it... 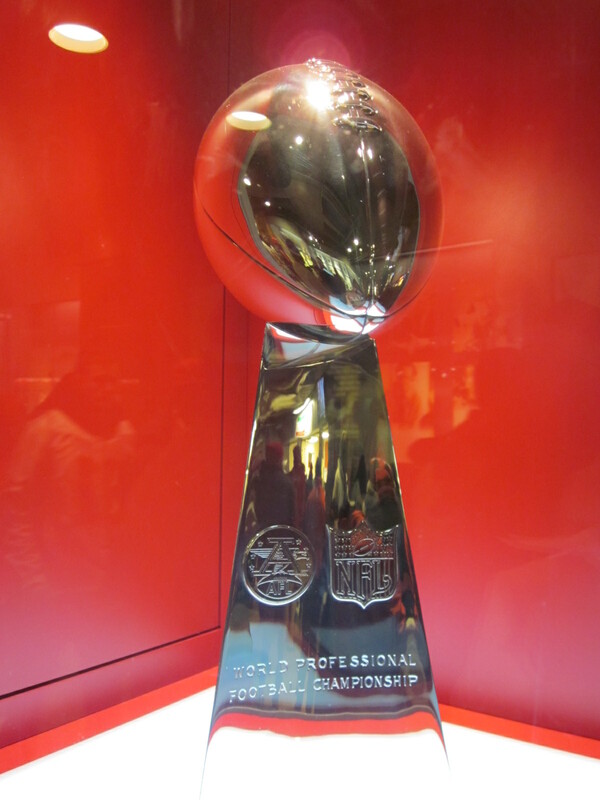 Relatively speaking though, the game was nothing compared to the AFC Championship game in 2004 (i.e. 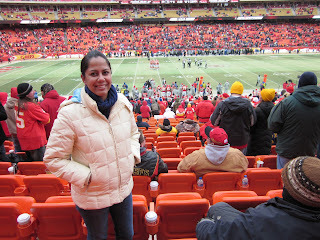 Indianapolis Colts v New England Patriots). Foxboro in January is brutal. The old man and his buddy chatted me up during the game and even brought me back a hot chocolate. Nice guys, but I expected nothing less since I was in the Midwest. 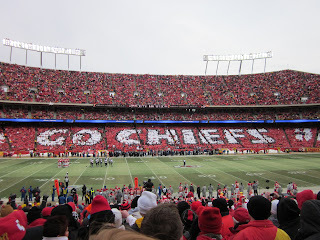 As the game started it appeared that the Kansas City Chiefs were going to make a ballgame of it. Matt Cassel definitely had his work cut out for him with the Baltimore Revens' defense. 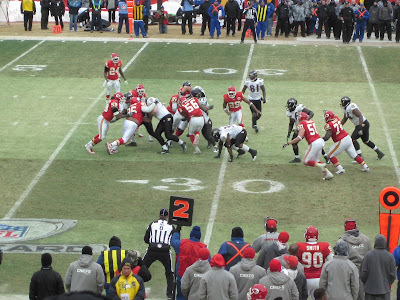 I figured out who Jamaal Charles was as he proved to be a force on offense. 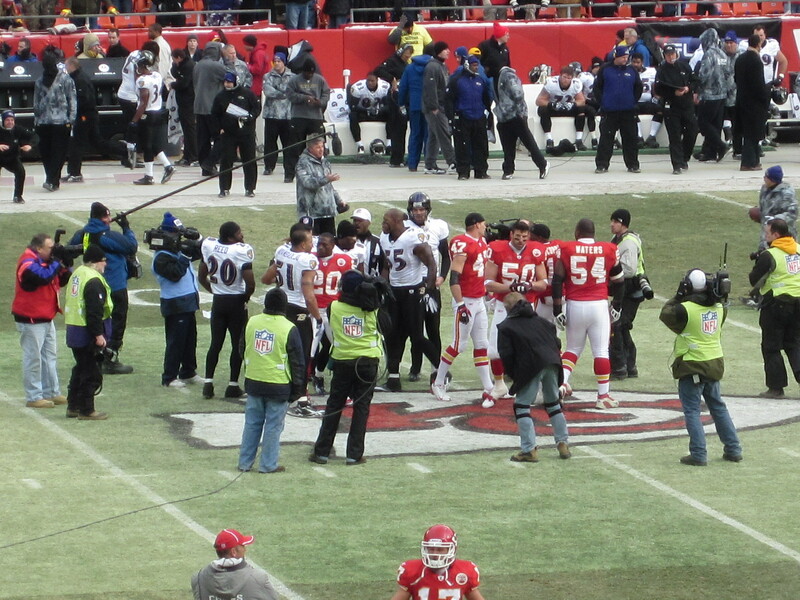 At the end of the day, the Ravens dominated the game and defeated the Chiefs. I saw Ray Lewis sack Matt Cassel in the 4th quarter, and all I can say is that I'm happy I wasn't the one being thrown onto the ground. Ouch. I've never been a huge Joe Flacco fan either, but he has my attention now. 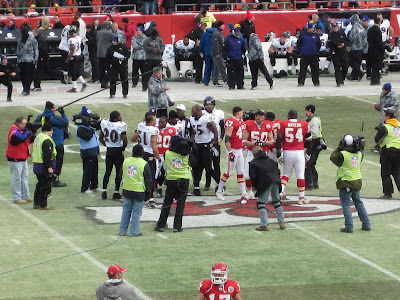 The final score for the AFC Wildcard game was 30-7, and the Ravens advanced to play the Pittsburgh Steelers on Saturday afternoon. After the game, I went straight to the airport to catch my flight. Coincidentally I arrived at KCI at the same time the Baltimore Ravens did. As I walked with them into the airport, I saw some kids in Ravens' jersey cheering them on. I mustered a "good game, guys" and kept it moving. It's not like I can recognize a football player without his jersey on, so sticking around and taking pictures would be stupid. I did notice a Raven following me, so I turned around to him and he asked me if I knew where the Southwest ticket counter was located. I told him I thought he was in the wrong area and that Southwest was either behind us or in a different terminal. Nice guy. I told him I was on my way back to Baltimore, but obviously he was headed somewhere different than his team. I asked the guy in the gift shop for directions for him and then walked to my gate. When I got home I checked the Ravens' roster and the mystery Raven, was Ed Dickson, Oregon alumnus. He was obviously on his way to Phoenix to watch (2) Oregon and (1) Auburn play each other for the BCS National Championship. Even though Sunday was a football day, there's no escaping basketball. Check out the exchange I had with my cab driver on the way back to the airport. Cab driver: I came here to play basketball. Me: You look like a 4. Cab driver: You know ball?